One of the most asked question and feature suggestion we receive from our costumers is the ability to clone a WordPress site. We were thinking how to make this since it needs to work between two geographic regions and while prototyping we found an extremely adaptable approach to make this. We didn’t want to make typical WordPress cloning feature, but a much more advanced and universal tool. 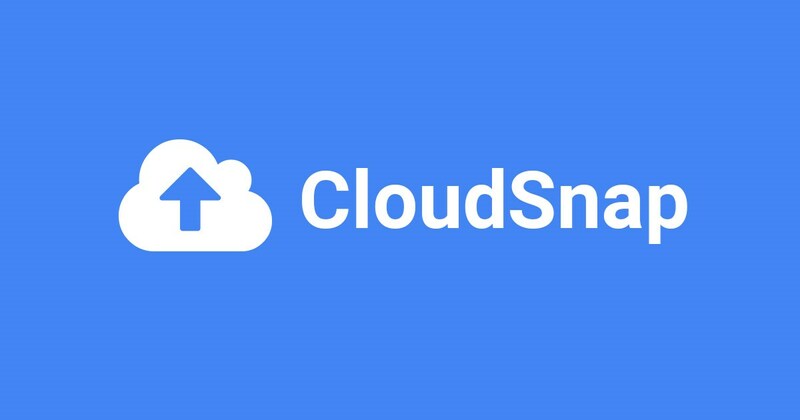 Today, we are happy to announce our new major feature, CloudSnap. 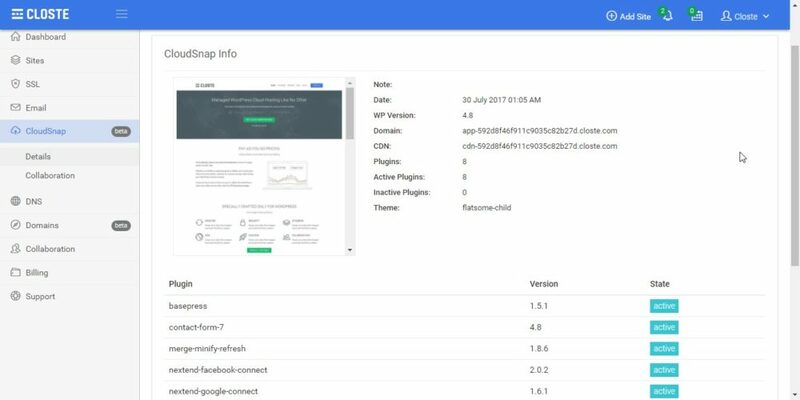 CloudSnap is a feature that takes a snapshot of your site and stores it on Google Cloud Storage. 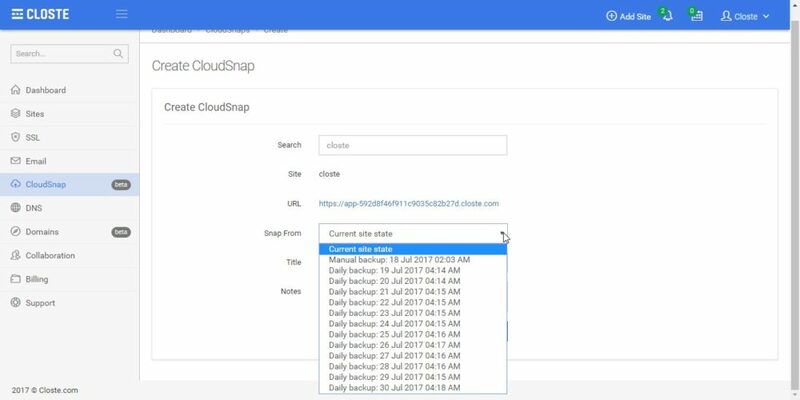 You can create CloudSnap from your current WordPress state, from backup or from staging site. CloudSnaps can be used to deploy new WordPress sites or to create staging site. Let`s focus on real life examples to see the power of our new feature. 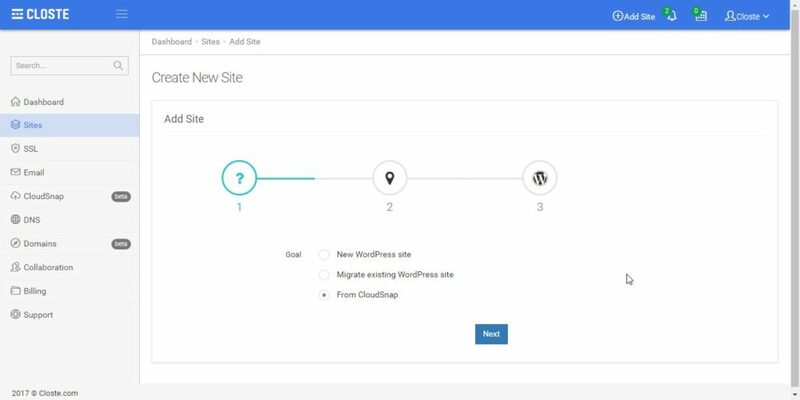 You can use CloudSnap to completely clone a WordPress site, in the same or another geographic region. If you already have a WooCommerce shop for US market but want similar for the European market or simply want to have another WooCommerce shop in the same region for other types of products, this can be done very easily using our CloudSnap feature. Cloning a WordPress site never been easier and all that without using a plugin with typical timeouts! Yeah we know, many developers stick with some themes and plugins. So why don`t you create a blueprint to save a lot of time next time you start a new project? 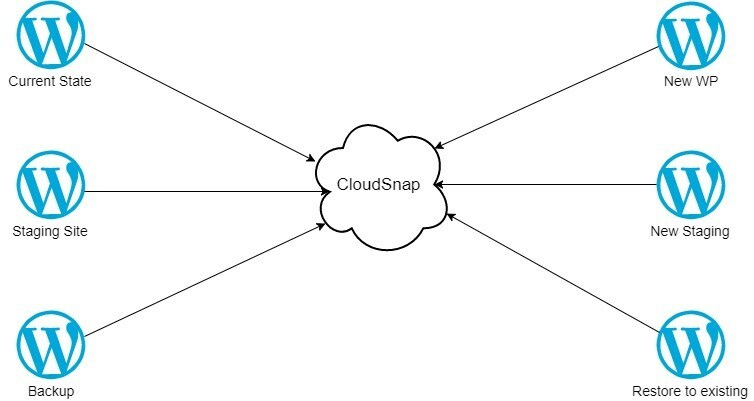 When you create a CloudSnap, a complete site is saved as a snapshot that you can use for building out future projects. We have many clients currently host their sites in the US but their main visitors are coming from SEA. When we announce our SEA region, why don`t we give costumers ability to migrate to the new geographic region simple as “click next next”. We already have very nice previews of backups including screenshot, plugin & themes list with versions and statuses. Anyway, nothing is enough compared to live preview of the backup. 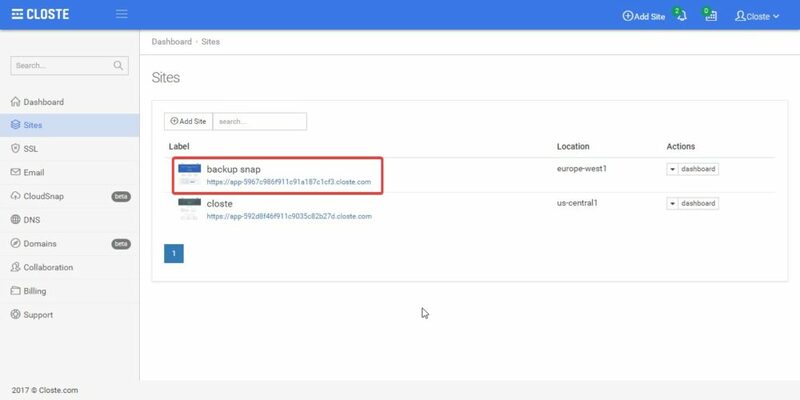 You can create CloudSnap from backup and after that create a new site ensure it is the right backup or just checking how some configuration looks there. Imagine you have two blueprints, one is “Maintenance” and another is “WooCommerce 3”. When you have a new project, you can simply deploy a new site with “Maintenance” CloudSnap and instantly create a staging environment with “WooCommerce 3” CloudSnap. In just 2 minutes you will have two sites, one to show your client that project is started and another one preinstalled WordPress with WooCommerce and all your standard plugins. In the end, you can show your client both sites, it’s up to you. Is your team on Closte? Cool, now you can share your CloudSnaps with them. One account is paying, another 100 are using! We already have automated backup system using the incremental algorithm with a maximum of 30 restore point. When your restore points are full, each new backup deletes the last one. With CloudSnap you can create long live full backups stored on Google Cloud Storage within 3 geographic regions. As we said, we didn`t want to make pure “Clone WordPress” feature, but we made something much more advanced and flexible. There are many other use cases and if you got something in your mind that is not possible to be made, leave us a message. We work very hard, in just 30 days we announced QUIC, Brotli, TLS 1.3, CloudSnap and many other minor features. 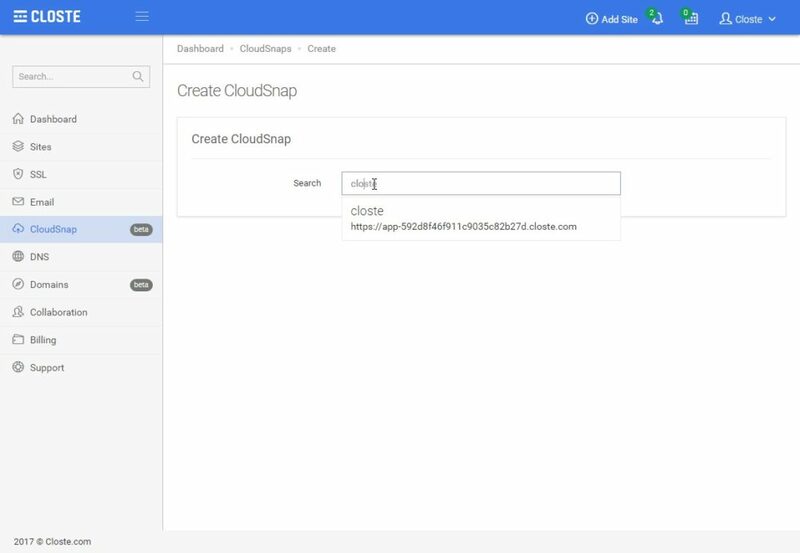 Let`s see how CloudSnap is working. You don`t need plugins, configurations, knowledge and you won’t have those typical “timeout” problems. 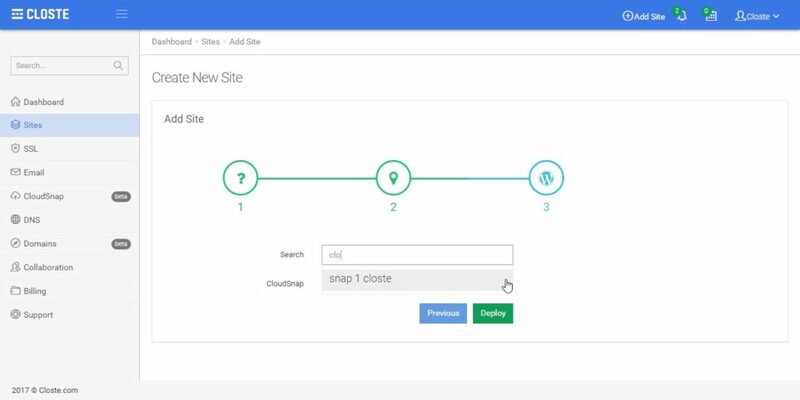 Type your site from which you want to create CloudSnap. Then you can choose the type of source, current site state or from a backup. After the process is finished, you can preview your CloudSnap. Now let’s create a new WordPress site from our CloudSnap, to get the feeling like we are cloning WordPress. That’s all, your cloned WordPress is ready.